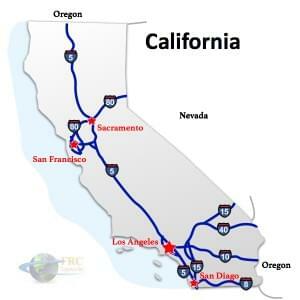 Arizona to California Freight shipping and trucking services are in high demand; the route from Flagstaff to Sacramento is a heavily traveled route. The Flagstaff, AZ to Sacramento, CA route is a 757 mile haul that takes more than 11 hours of driving to complete. Shipping from Arizona to California ranges from a minimum of 5 miles and 10 minutes on the road from Ehrenberg, AZ to Blythe, CA, and over 1,334 miles and a minimum of 21 hours on the road from Apache, AZ to Crescent City, CA. The shortest route from Arizona to California is along I-5 N, however there is a more easterly route that uses the US-95 N, passing through Phoenix, AZ and Las Vegas, NV. California is a large, densely populated state, especially along the Pacific Coast where the San Francisco, Los Angeles and San Diego metropolitan areas link northern, central and southern California. For the most part, California has a pleasant and mild climate. It’s hotter and drier in the south, and the north is colder in the winter and wetter in the summer. With mountains in the east and hills in the west, along the coast, it’s is a beautiful state to drive through, but it can be demanding for California truckers. Many truckers would say that California’s greatest challenges lie in its diesel regulations and traffic congestion. Arizona to California Freight shipping quotes and trucking rates vary at times due to the individual states industry needs. Since Arizona’s Industries are more industrial than agricultural, with manufacturing and distribution centers throughout, we see plenty of shipments by Flatbed as well as by the more common dry van trucks. California is more agricultural, with food processing and food distribution centers, we see plenty of shipments by refrigerated trailers and trucks. Our Less Than Truckload (LTL) carriers in both Arizona and California are also running a number of regular services between the two states, and it’s an active route for flatbed freight shipments, as well.